Today was a day of going back and forth with RockStar, so it was pretty dedicated to work. I woke up at 4:30am to talk with him in New York – bleh. Made some adjusments and slept for a 1/2 hour here and there while the computer rendered. Wake up. Check image. Make tweaks. Re-render. Sleep. Wake up. Check image….meh, its a living. No rain, but very chilly, as was found out from a quick walk around town. I wore my jacket with the hood. Just in case. Although, it seems like Wellington chooses the weather for the day, and then sticks to it. It changes while you sleep. So, if you plan for something in the morning, then those plans aren’t shattered by a sudden change of climate. I’m surprised to see kayakers in Oriental Bay. I guess rain is the only thing that keeps them away. 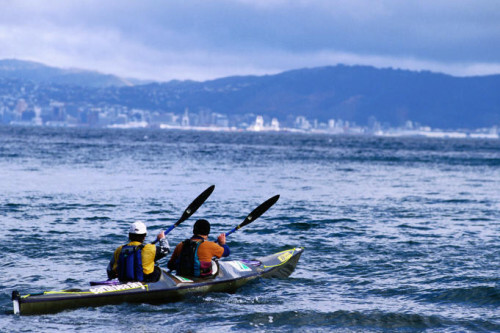 Never mind the 40 degree water that you could fall into should the kayak capsize. Its that darn rain you have to be worrying about. I start work tomorrow, so my journals are going to taper off in detail substantially. But I’ll try and keep you all in the loop. P.S. :I have not heard one person use the term ‘Crikey’. Maybe that’s reserved for Australians.